No matter the organization, digital transformation has a bigger impact on the day-to-day work of Canadian CIOs than previously thought, according to the 2017 CanadianCIO Census. Digital transformation is without question on the mind of CIOs when speaking about the next five years, but the surprise comes from the impact the idea of digital transformation has these CIOs daily work routine. 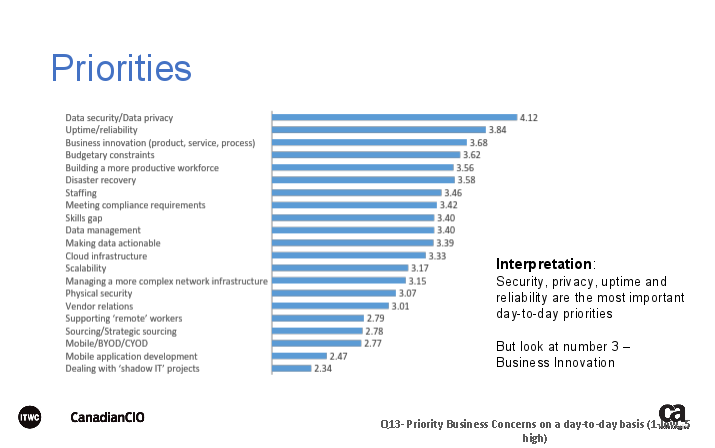 According to the over 160 senior IT leaders in Canada surveyed in early 2017, business innovation is the third highest priority day-to-day after data security/data privacy and uptime/reliability respectively. “CIOs getting up and having those dangerous conversations about innovation and digital transformation are happening. We are going out and talking to people, talking about challenges and what we are thinking. This is new. This is radical. And you can see it when you talk to CIOs and technology leaders,” said Jim Love, CIO of ITWC. Love presented the preliminary findings of this year’s report to open ITWC’s Digital Transformation Awards on June 14. Kovar Gregory, senior director at CA Technologies mediated. The ITWC 2017 CanadianCIO Census was conducted alongside CA Technologies. While the day-to-day aspect of digital transformation may have been the biggest surprise, the key stat to note from the report is how important the customer is to digital transformation. Those surveyed report that the top two reasons for digital transformation is the need to respond to customer expectations, and to demonstrate to customers, employees, and others their innovative capabilities. Customers relations and costs are driving digital transformation, while trends like competitive leadership and competitive pressures are less important than before. “You look at this and see the reality of the customer and the focus on the customer is there. Currently, it’s the year of customer experience,” said Love. The trends in hiring also point to how digital transformation has impacted Canadian organizations across the board. 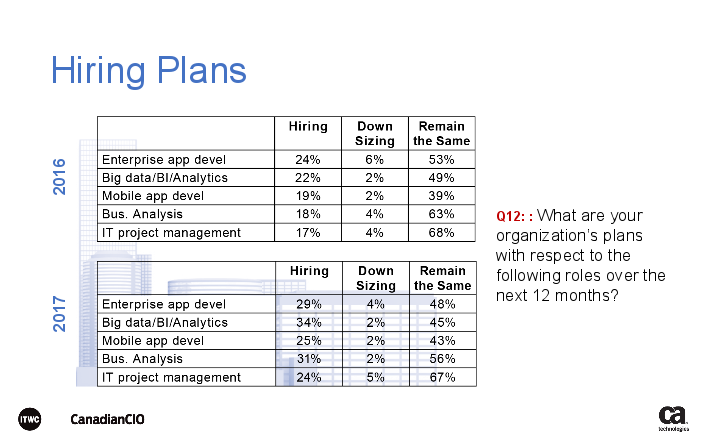 Across all areas surveyed – enterprise app development, big data/BI/analytics, mobile app development, business analysis, and IT project management – companies are hiring more in 2017 than they did in 2017, and in some cases exponentially more. For instance, in 2016 18 per cent said they were hiring for business analysis. That number jumped to 31 per cent in 2017. “This has been a consistent trend. Take a look at big data for instance [22 per cent in 2016 to 34 per cent in 2017]. You can start to see how organizations are addressing digital transformation with how they are hiring,” said Love. Both cloud and enterprise mobility have exceeded expectations. 70 per cent of Canadian senior IT leaders stated that the cloud met or exceeded expectations, and more are using cloud than ever before. Technologies that fell below expectations are: outsourcing, big data analytics, enterprise collaboration, and social. More than half are increasing IT budgets (60 per cent), with only 14 per cent decreasing IT budgets. 43 per cent of organizations are growing IT staffs. Only 7 per cent are reducing IT headcount.